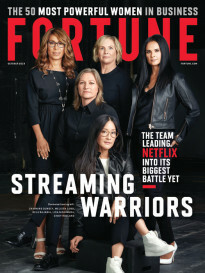 Software maker Intuit is number 8 on Fortune’s new list, The Future 50 – which identifies the companies that are best prepared to thrive in the future. At age 34, the company is a model of constant reinvention. What’s the secret to its success? Well, there is a commitment to transparency – CEO Brad Smith keeps his unedited performance review taped to the wall by his office door. There’s also the decision to turn its software into a platform, on which other companies and developers can build apps that work with Intuit’s. And then there is this credo: “savor the surprise” – which means focus on the research finding that makes no sense. Most organizations do the opposite – ignore information that doesn’t fit preconceived notions. At Intuit, they look for evidence that disproves preconceived notions. 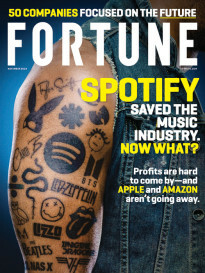 You can read more about the Intuit way in Geoff Colvin’s piece for the November issue of Fortune magazine, which we are releasing online this morning. News below, and enjoy the weekend. The Senate approved a budget blueprint for the 2018 fiscal year that will pave the way for Republicans to pursue a tax-cut package without Democratic support. By a 51-to-49 vote, the Republican-controlled Senate approved the budget measure, which would add up to $1.5 trillion to the federal deficit over the next decade in order to pay for proposed tax cuts. The resolution has to be reconciled with a markedly different version passed by the House of Representatives, where Republicans say negotiations on a unified measure could take up to two weeks. California authorities are investigating potential neglect on the part of Pacific Gas & Electricity that might have contributed to the recent wildfires. One couple has already sued the utility directly, alleging that badly-maintained power lines were responsible for starting at least one of the blazes. Insurance losses from the fires are likely to top $1 billion. Walmart is close to landing a deal to give department store Lord & Taylor dedicated space on its website, a move that could presage the retailer offering itself to other brands as an alternative to Amazon.com for showcasing their wares. According to the WSJ the deal would be a first step in creating an online mall with Walmart.com as its front door. Other brands in the mall could include men’s clothing store Bonobos and online retailer Jet.com, both of which were part of a shopping spree of e-commerce companies by Walmart in the last 15 months. President Donald Trump chose Joseph Simons, an antitrust attorney from the Washington D.C. office of law firm Paul Weiss, to head the Federal Trade Commission. Noah Phillips (R.) and Sen. Elizabeth Warren buddy Rohit Chopra (D.) will fill the other two seats that have been vacant for months. • Lyft Gets A Billion From Alphabet and Co.
Lyft completed a $1 billion funding round in which Alphabet was the chief investor. The capital injection, which values Uber’s biggest domestic rival in ride-hailing at $11 billion, will arm it for its first overseas forays. The rift between the GOP establishment and the current White House continued to widen, with former President George W. Bush (implicitly) and current House Speaker Paul Ryan (explicitly) adding their voices to those of Sens. John McCain and Bob Corker. Bush lamented on “emboldened bigotry” in a powerful speech about American values, while Ryan reeled out a string of anti-Trump jokes at the annual Alfred E. Smith Memorial Foundation dinner. Quentin Tarantino, whom Harvey Weinstein made a household name with his distribution of Reservoir Dogs and Pulp Fiction, admitted in an interview with the New York Times to having known about the mogul’s predations and “marginalizing” reports of them as they reached him over the years. Tarantino’s partnership with Weinstein spanned 20 years (the Weinstein Company distributed recent works such as Django Unchained).